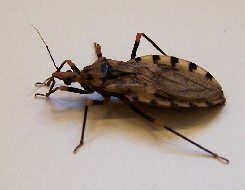 A fatal disease called Chagas disease is transmitted to humans from an insect bite. Presently it affects about 15 million people and causes 50,000 deaths every year. The disease is carried around by the triatominae family of bugs, or also known as kissing bugs (kissing because they like to bite the face of humans, as it is the part of the body that is usually uncovered during the night). The insect looks like this and usually dwells in old homes or in the wild. At home, it can be spotted with feces marks on the walls or by spotting the insect itself. If you live in the southern part of USA or somewhere between there and Argentina, you could be close to these insects. Acute-phase symptoms of Chagas disease may be swelling and/orredness at the skin infection site (termed chagoma), rash, swollen lymph nodes, fever, head and body aches, fatigue, nausea, vomitingand/or diarrhea, liver and/or spleen enlargement, and the Romaña sign.